Legato Grigio is the assimilation of the 2 most important lines that we wanted to bring to our grey breeding program. He comes by his elite fleece not unexpectedly. Dad is RR Gun's A'Blazin' who has now shown by both histograms, and follicle skin testing that he is consistantly producing fineness, density and uniformity and was a 15 time banner winner. Mom, Snowmass Golden Dreams, has been one of our best producers. We have amassed countless banners from her offspring, among whom is our pre=potent herdsire Snowmass Midnight Sun. LG has demonstrated his pepotency repeatedly in his production. AS we had hoped, he is able to transmit solid grey as a dominant, in many shades. His pattern appears to be a spotting, not tuxedo , pattern and we have used him on solid colors with excellent success. We have not bred him to tuxedo patterns. The numbers dont lie: Histograms: 2012 16.0/ 3.9/ 23/ CF 100%/ length 90mm 2013 18.3/ 4.1/ 23/ CF99%/ length 105mm 2014 17.3/ 3.85/ 22.24/ CF 100 length 90.0 2015: 19.3/ 4.3/ 22.3/ CF 97.3 length 90mm Biopsy (Alpaca Consulting/ Ian Watt): Density 64.6/mm2 S/P ratio 11.8:1 In-skin mean primary fiber diameter: 25.9 SD 2.8 In-skin mean secondary fibre diameter: 20.6 SD 2.8 Comments: Excellent density well supported by an above average S:P ratio and very uniform fiber populations, among the best recorded for this color to date. There's lots to like about Kit Carson's offspring and Jasmine is no exception. 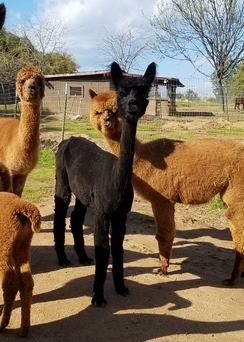 She has a non fading beautifully organized fleece with the density, brightness and length that you would expect from his progeny. Want persitant fineness...have a look at the serial histograms at both parents who possess 22 micron fleece at age 6 (dad) and 7 (mom, Snowmass Braveheart's Charm). As for Jasmine, 21 microns with a comfort factor of 97.9% (i.e. 2% of fibers over 30 micron), is a very commendable fleece in black. Both sire and dam have outstanding producers. For her current breeding we have chosen RR Dizzy Gillespie, our "chosen" Legato Grigio son. 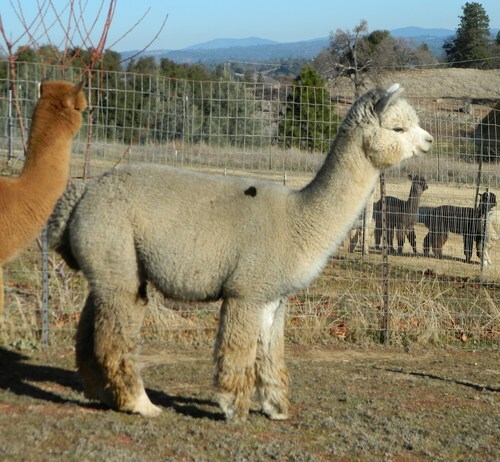 He was selected for his sturdy compact phenotype, outstanding fleece and follicle testing (by skin biopsy) analytics and his dominant roan genetics. 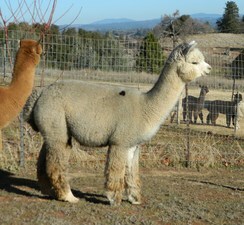 Dizzy is what is referred to as a "strawberry roan" (modern light rose grey in the show ring). 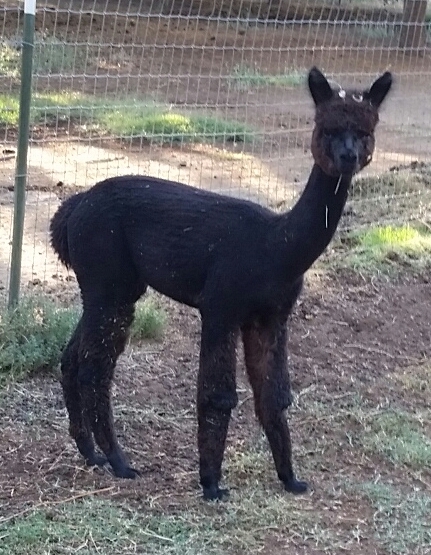 He is one a large number of roans that we have been breeding for in our herd with a dominant pattern of inheritance through three generations. 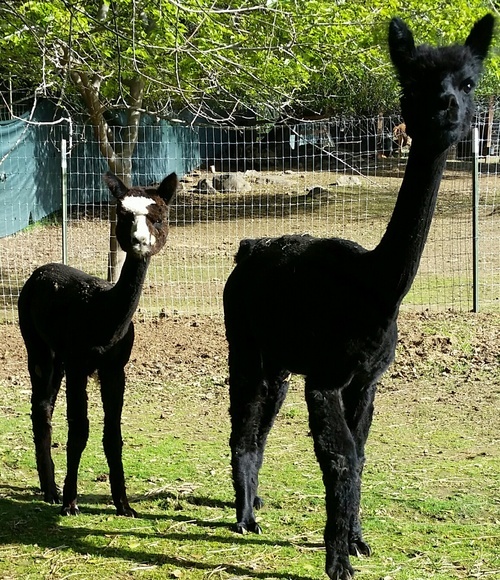 The genomics are are continuing to be evaluated in the grey color genetics study being currently done by Kylie Munyard PhD and Samantha Brooks PhD. The full genomic sequence is being done on the Dizzy Gillespie and 17 of his relatives...and more to come. 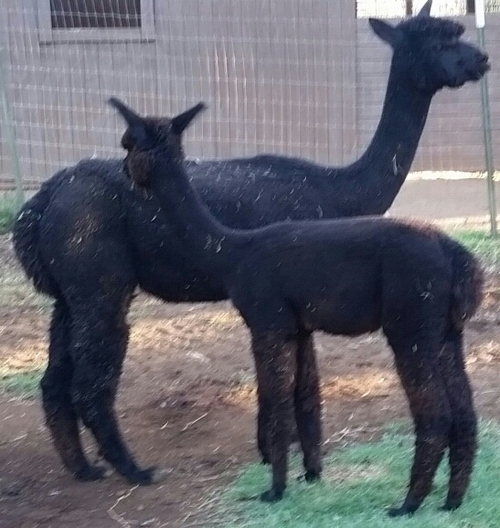 None of the roans have anything other than complete color uniformity in the blanket. We believe that genomic markers will result in the breeder using him to have the earliest use of genomics to develop a breeding strategy and will mirror the experience of roan horse breeders. We are very optimistic about the outcome of this pregnancy next spring.